Last chance: We only have 22 left - This product will not be available again once our stock runs out. Enjoy a relaxing Sunday morning basking in the cleansing and invigorating scent of Morning Mint! Buy 1 for $4.00Buy 2 / Save $0.21!Buy 3 / Save $0.80! 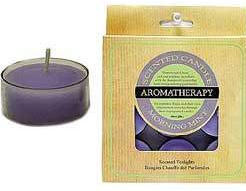 Size (inches): 5.12" X 0.98" X 5.12"
This set includes 9 long-lasting, clear-capped candles that are ideal for aromatherapy oil burners or for small candle holders. Mauve colored and lightly scented, these lights can also be used on their own placed atop the side of a bathtub, or as a floating display with flower petals in a vase. Feel revived and refreshed with Morning Mint Tea Lights!